Protein are the building block of the body. Collagen is found as strong non-elastic white fibres in tendons, cartilage and bone. Elastin is found as yellow elastic fibres in ligaments and joint capsules. Keratin is found as a horny impermeable protein in skin, hair, feathers, nails and hooves. Lipoproteins of cell membranes, viral coat proteins, fibroin are found as spider silk and cocoon silk, sclerotin found in insect exoskeletons, and mucoproteins found in lubricating joint (synovial) fluid. Protein is a major source of energy. Insulin, a small protein, is an example of a hormone that regulates blood sugar. Secretin, is another example of a protein hormone. This substance assists in the digestive process by stimulating the pancreas and the intestine to create necessary digestive juices. Enzymes are proteins that increase the rate of chemical reactions in the body. Hemoglobin is a protein that transports oxygen throughout the body. Ferritin is an example of a protein that combines with iron for storage in the liver. Actin and myosin found in muscles and dynein making up the structure of cilia and flagella. Protein forms antibodies that help prevent infection, illness and disease. 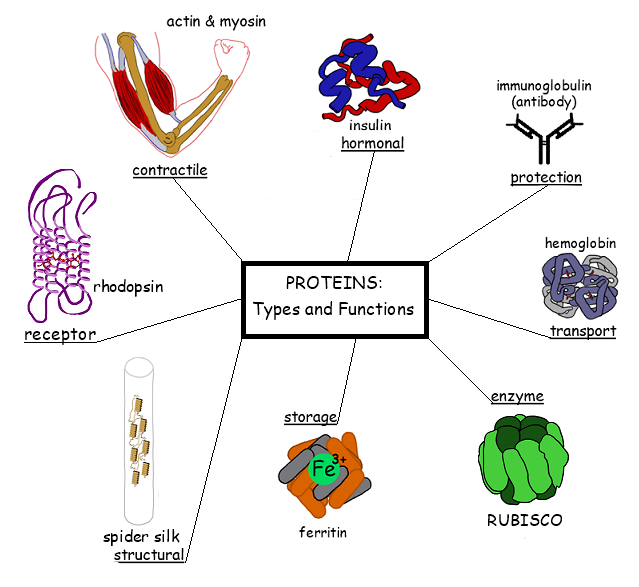 Messenger proteins, such as some types of hormones, transmit signals to coordinate biological processes between different cells, tissues, and organs. Proteins are also essential for moving polarized or charged molecules and large molecules across cell membranes. When the body’s energy sources are low, it begins to degrade proteins for use as an alternative energy source. Blood proteins such as albumin and globulin function to maintain fluid balance in the body.